Now look for the Asherah ritual stand hidden here. 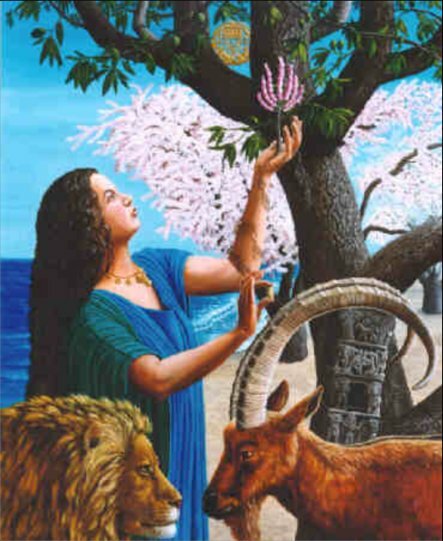 See Asherah holding a little tree in her hand in the shape of the menorah, the 7-branched candlestick? It was huge and stood in Solomon’s Temple, a god/goddess temple. The bible says the Menorah was based on an almond tree. It had almond shapes to hold the oil at the top of each of the seven branches, and under each almond shaped cup was an almond bloom shape. Almonds are vesica piscis, goddess symbol. It was a tree of life. An Asherah tree. Notice the blooming almond tree behind the larger tree which may be an acacia tree. She’s got her Lion & Ibex. The Sea that she walks on. She can be found where land and sea meet.